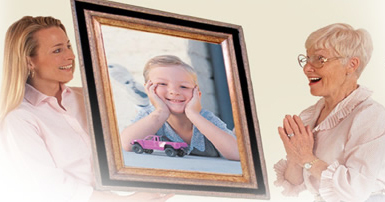 Image Decor / Canvas Arts, Inc. is an industry leader in photo-to-canvas printing. Our unique printing processes and proprietary software allow us to take even a wallet-sized picture and enlarge it up to a 1,000 times! We use patented canvas and ultraviolet (UV) proof coatings to protect your photo-to-canvas prints from sunlight degradation and fading, adding years of life and beauty. Memories may fade, but your canvas prints will be there for years to come! We can provide you with beautiful framed, stretched canvas, or rolled canvas reproductions of your favorite photos or digital images of your special occasions or that favorite someone! We also have an Art Gallery you can browse to find affordable artwork for your home or office! Order your special piece today! You can be assured that great care and attention to detail will be provided when creating your new photo-to-canvas print. Our digital printing experience over the last decade gives us the know-how to satisfy our customers with only the finest quality. Our goal is to make you a satisfied customer; therefore, we inspect each photo we receive to ensure the best output resolution, which results in a beautiful, quality print. We achieve customer satisfaction by using the best materials and state-of-the-art hardware to produce your long lasting digital images. Memories may fade, but our prints will be there in the shape you ordered them for years to come. "Being the BEST" is defined as continuously providing our customers the Highest Quality Imagery, while at the same time, setting the benchmark for industry standards. We're the high-water mark for digital imagery, because we provide an easy customer resource for price and quality--always a welcome combination.